The In-Kone® system offers a complete range of prosthetic components. The slim, tulip-shaped emergence profiles enable a thick, protective mucosal joint to form, which promotes tissue stability and maintains the attractive appearance over time. 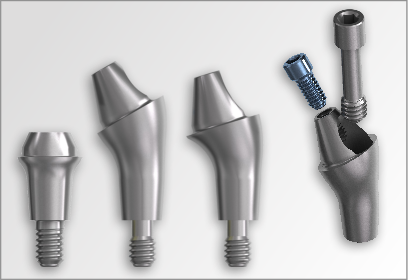 The healing screw is an essential component in the restoration phase of the In-Kone® implant system as it prepares the prosthetic seating for the final component. Each prosthetic component has a corresponding healing screw for tension-free insertion.. 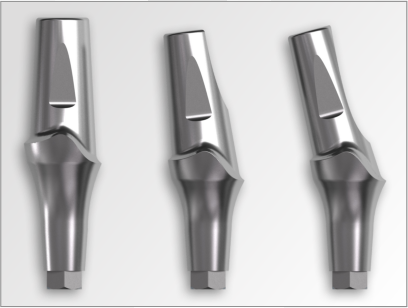 The pre-milled blanks are used by prosthetist (who has the adequate equipment) in order to manufacture personnalized abutments in his own laboratory. The manufacturing with titanium blanks is a great opportunity for implantology profesionnals to achieve a CADCAM solution of proximity with the connections guaranteed to comply with our industrial machining specifications. Profiled abutments are indicated for single and multiple cement-retained restorations in aesthetic zones. The anatomical cervical limit is scalloped so that it adapts to the natural contours of the mucosa with minimum modification. The profiled abutment is ideal for cases of recent extractions..
Profiled abutments are indicated for single and multiple cement-retained restorations. The cervical limit can be modified in the laboratory in order to customise the vestibular chamfer according to the mucosal profile. Short abutments are very easy to use. Once they are in place in the mouth, the impression is taken directly from the abutment. An impression coping is used to accurately record the limit of the future crown. 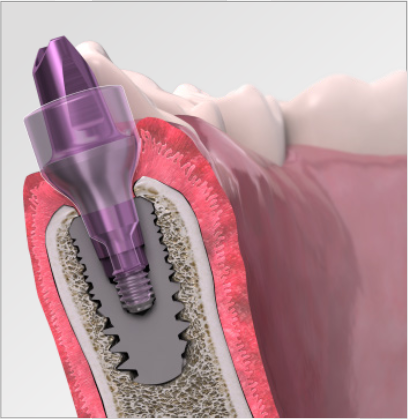 The short abutment helps to reduce the number of prosthetic operations, helping to protect the biological area. The short abutment is ideal for single and multiple cement-retained restorations in the molar area. 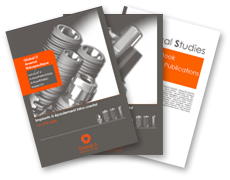 Tapered pillar abutments are indicated for screw-retained bridges, prostheses on bars and for the Quattro system. 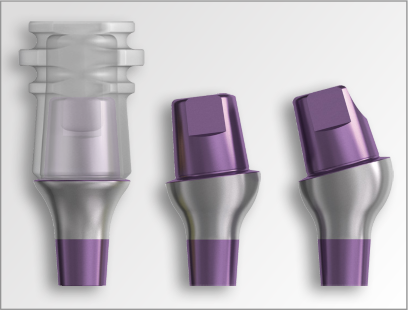 They are available with a 0°, 17° and 30° angle, and in a wide range of periodontal heights..
Angled pillar abutments are available in both rotational and anti-rotational versions so that practitioners can work using a direct or indirect method. The In-Kone® range also includes a series of customisable components indicated for single cement-retained or screw-retained restorations. 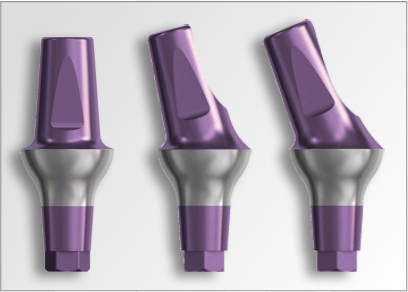 The In-Kone® system has a range of ball attachments or Locator® pillar abutments for stabilising complete devices. These two proven attachment systems enable you to offer the most suitable solution for each situation.. Global D works in partnership with Panthera Dental to make your bars. Panthera is an expert in the design and manufacture of top of the range CAD/CAM customised bars and pillar abutments. 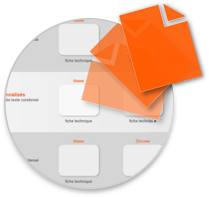 Panthera has a wide range of solutions for your cases, from the simplest to the most complex. 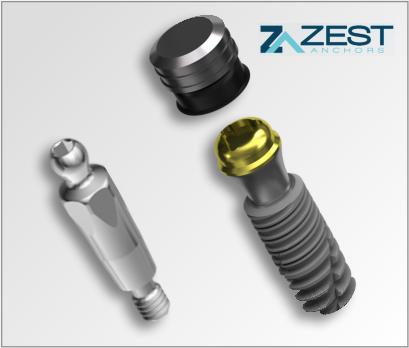 The customised pillar abutments are available in titanium or chrome-cobalt as well as in zirconia on a base.